The other day I tried to imagine how it would be to live in a well-appointed, well-furnished house with big airy rooms and a semblance of elegance. First I had to imagine myself in decent clothes. I could not go into a house with coffered ceilings, a ligne roset sofa and an antique Mahal rug wearing ten year old j.crew madras shorts and a tee that says Free the Wales with a faded pix of Charles and Diana. I imagined myself in a black linen suit with an a-line skirt and short double-breasted jacket with big white buttons. I wore platform pumps with the toe cut out. My hair was styled and I weighed thirty pounds less. I tried to imagine my face fighting the urge to see it drawn and saggy from the sudden weight loss. I imagined walking into the beautifully constructed living room and standing still. What would I do in there? In real life, I spend little or no time in the living room - unecessary space we’ve been told is necessary. In my new persona I sat on the short end of the sectional whose seats were molded to hold you and looked around. I glanced to my left and saw that someone had placed my mail on a small mission desk that backed up on the sofa. In front of me was a square coffee table made of a matte stone in tones of beige and black with tiny wormholes. I thought of looking through the mail but decided instead to look through my mind. How did I think in these unfamiliar circumstances? I looked for my old thought catalogue: this house is falling apart I can’t stop eating Katie Couric looked good on The View. I haven’t been outdoors in two days the lawn needs cutting the big tree in back is going to fall over and kill me where is my hairbrush I’m afraid of taking Tylenol p.m. because I might not wake up my feet still look good the gutters are filled and there’s no one stable enough to climb a ladder and get them out I can't stop looking at J.Lo I need a manicure and a pedicure my eyebrows need shaping the ground turkey that is a staple has been recalled but I already ate it I love Alec Baldwin why did I think I could manage my own brokerage account if I thought about the money I’ve lost, it would make me pass out and why did I sell the New York apartment so soon when now it’s worth five times more the rich guy next door has the loudest air conditioner I’ve ever heard and it runs 24/7 he waters his lawn so much there’s a perennial puddle in front of my house where mosquitoes are breeding by the millions but I am annoying the neighbor on the other side with my huge tree that sheds leaves and other debris all summer long and keeps his driveway filled with stuff and oh, the kids. That catalogue was back in my old house. In my new house the mind was quiet and the person thinking was calm and focusing on her surroundings with satisfaction. I didn’t know what to make of this person. She had no self-doubt. Her thoughts were sequential and outward directed: the masseuse was coming, the novel was at a good point, she would take a run at four and shower before dinner. There was not one thought in there that was trying to make sense of the world. She wasn’t wondering where she went when she was asleep or what dreams were all about. She wasn’t still brooding about the Yahoo news story where a mother had shoved her toddlers out of the path of a runaway truck or the girl who had sold more Girl Scout cookies than anyone and then died at her graduation dance. I decided to stay for the masseuse and then go back home. Now that I think about it, I wrote a book with a similar plot. 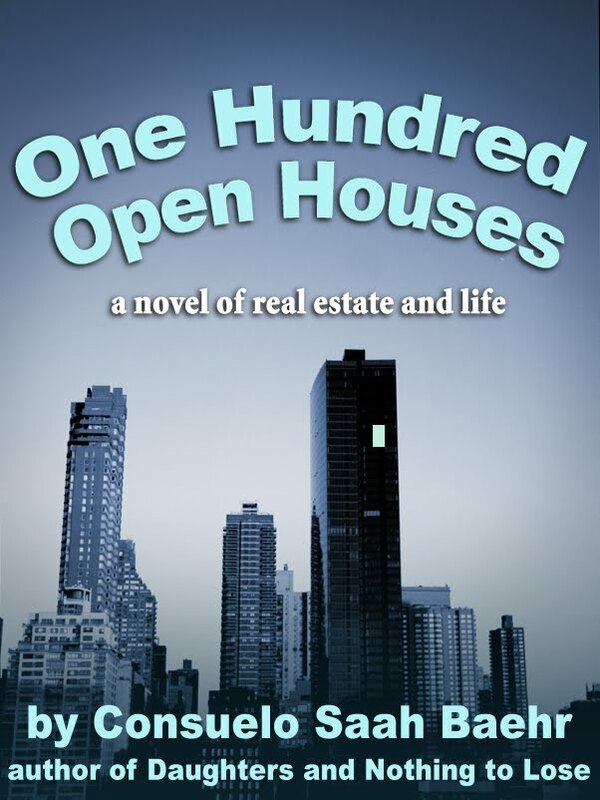 It’s called One Hundred Open Houses. I have a similar manse in my brain, but mine is modern and comes fully staffed. I don't iron and I don't answer the phone. But I do order people around in a polite way that says "I like you but not that much." Then I snap out of it and throw the clothes in the dryer. 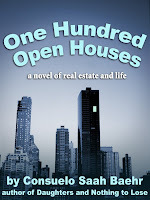 yep, 100 open houses is a super read. it's how "i met you." everyone who comes to my house, looks up at the second story bedroom window from my back yard and say "hey, you are about to lose that screen." and i say "i know, but i need someone to climb up my ladder and fix it-because i have vertigo." and then they leave and my screen now has been hanging by two thumbnails (so to speak) for how long know. i still have gorgeous kneecaps.